By the year 656, most of the South Caucasus except Lazica –Egrisi, was overrun by the expanding Arabs and became part of the Arab Caliphate that by that time included all of the Middle East, North Africa and parts of Europe (click on the map to get the full-screen image). 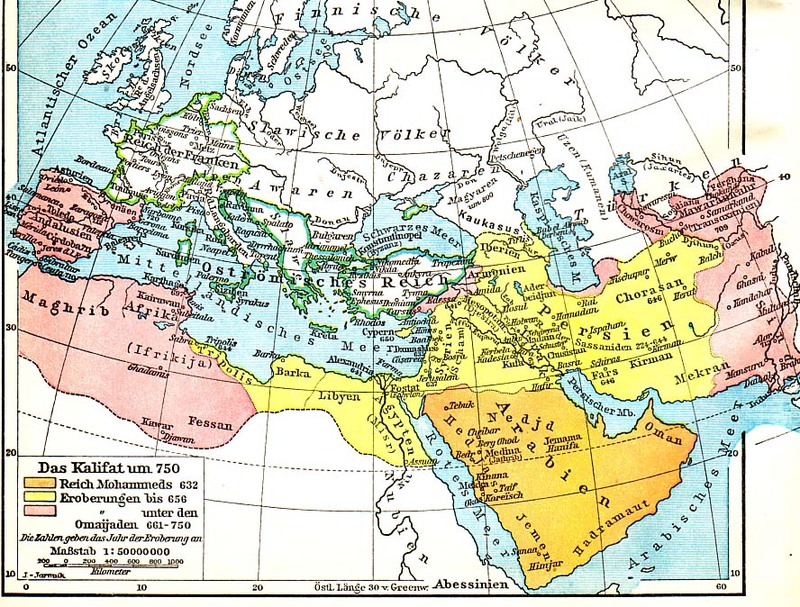 However, the Byzantine-Arab wars and partial disintegration of the Caliphate, created pre-conditions for the restoration of some elements of Georgian statehood: between 780 and 810 several principalities, kingdoms and other domains in the former Iberia gained sovereignty by throwing off the Arabs. At the very end of the 8th century, Abkhazian Achrontos (Byzantine-appointed Governor) Leon launched an anti-imperial uprising, ousted Byzantine troops from most of Lazica, proclaimed the Kingdom of Egris-Abkhazia and bestowed the title of the King upon himself. As of today, some verbal supporters of Abkhazian separatism mistakenly believe that the Kingdom of Egris-Abkhazia was the first state of the Apsuans. That is wrong due to the fact that by its whole nature, Egris-Abkhazia was a pure example of a Georgian state: the majority of its population were Svans, Zans and Kartvelians (all the three groups were speaking closely related languages and were representing the branches of the furture Georgian nation), the official languages were Kartvelian (Georgian) alongside with Greek, the capital of the Kingdom was Kutaisi that was almost purely Kartvelian city. Two decades later, Egris-Abkhazia also seceded from Byzantine Empire ecclesiastically: Egris-Abkhazian church broke with the Patriarch of Constantinople and went under the Jurisdiction of the Catholicos of Mtskheta (the head of East Georgian Orthodox Christian Church) and switched the language of services from Greek to Georgian (Kartvelian). In fact, that was the creation of a united Georgian church that has been existing since the above events excluding a relatively short period of time between 1810 and 1917. The end of the 10th century saw the forming of the first united Georgian monarchy when Curopalate David of Tao-Klarjeti invaded the Erldom of Kartli previously disputed between the Emirate of Tephelis, and the Kingdoms of Kakheti and Egris-Abkhazia, and crowned his adopted son Bagrat Bagrationi the King of Kartli in 975. Three years later, after the death of his uncle Theodosius the Blind, King of Egris-Abkhazia , Bagrat inherited Abkhazian throne. In 1001 Bagrat also included Tao-Klarjeti (Curopalatinate of Iberia) into his domain as a result of David’s death and finally, in 1008-1010 annexed Kakheti and Ereti thus becoming the King of the united Georgia both eastern and western. The second half of the 11th century was marked by the disastrous invasion of the Seljuk Turks who by the end of 1040s succeeded in building a vast nomadic empire including most of the Central Asia and Iran. In 1071 Seljuk army destroyed the united Byzantine-Armenian and Georgian forces in the battle of Mantsikert, and by 1081, all of Armenia, Anatolia, Mesopotamia, Syria and most of Georgia and other countries of the area were conquered and devastated by the Seljuks. In Georgia, it was only Abkhazia and mountainous areas of Svanetia, Racha and Khevi-Khevsureti remained out of Seljuk control and served as relatively safe haven for numerous refugees. All the rest of the country was dominated by the conquerors that were destroying the cities and fortresses, looting the villages, wiping out both aristocracy and farming population and colonizing the country with the nomadic tribes from Central Asia. In fact, by the end of the 80s of the 11th century, Georgians were at the edge of being irreversibly outnumbered by the newcomers in their own land. The Anti-Seljuk struggle in Georgia was led by the young King David IV who inherited the throne in 1089 in the age of 16 after the death of his father George II Bagrationi. Soon after coming to power, David re-built regular army and created peasant militia in order to be able to resist Seljuk colonization of the country. The First Crusade (1096-1099) and Crusaders’ offensive against Seljuk Turks in Anatolia and Syria favored David’s attempts to re-conquer Georgia. By the end of 1099 David stopped paying tribute to the Seljuks and put most of Georgian lands except Tbilisi and Ereti under his effective control having Abkhazia and Svanetia as his reliable rear bases. David Agmashenebeli’s successors (Kings Demeter I, David V and George III) continued the policy of Georgia’s expansion. However, the most glorious sovereign of Georgia of that period was definitely Queen Tamar (David’s great-granddaughter). Reign of Queen Tamar was the peak of Georgia’s might in the whole history of the nation. In 1194-1204 Tamar’s armies crushed new Turkish invasions from the south-east and south and launched several successful campaigns into Turkish-controlled Southern Armenia. As a result, most of Southern Armenia with the cities of Karin, Erzinjan, Khelat, Mush and Van, was put under Georgian control. Although not included into Georgian Crown lands and left under nominal rule of local Turkish Emirs and Sultans, Southern Armenia became a protectorate of the Kingdom of Georgia. The temporary fall of the Byzantine Empire in 1204 to the Crusaders left Georgia the strongest Christian State in the whole East Mediterranean area. The same year Queen Tamar sent her troops to take over the former Byzantine Lazona and Paryadria with the cities of Atina, Riza, Trebizond, Querasunt, Amysos, Kotyora, Heraclea and Sinopa. In 1205, the occupied territory was transformed into the Empire of Trebizond with Tamar’s’ relative Prince Alexius Comnenus crowned Emperor. Although officially called an Empire the new state was Georgia’s dependency for more than two hundred years. In 1210 Georgian armies invaded northern Iran (today’s Iranian Azerbaijan) and took the cities of Marand, Tebriz, Ardebil, Zenjan and Kazvin putting part of the conquered territory under Georgian protectorate. That was the maximal extent of Georgia throughout her history. 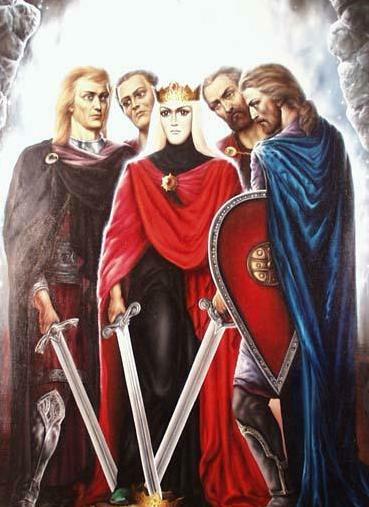 During the described period of time Queen Tamar was addressed as “The Queen of Abkhazians, Kartvels, Rans, Kakhs and Armenians, Shirvan-Shakhine and Shakh-in-Shakhine, The Sovereign of the East and West”. Georgian historians often refer to her as “Queen Tamar the Great”. The Golden Age was interrupted by the Mongol invasions of the early 20s of the 13th century.